As I was walking back from my cycle class today, I got a text from Holly (and Finn!) to see if we (I just wrote we!!) if I wanted to do lunch today. I am always up for a lunch out, so I confirmed and they came over so we could walk into town. We ended up at The Whiskey Jar and had a fabulous lunch! I’ve been really impressed with the food here so far! 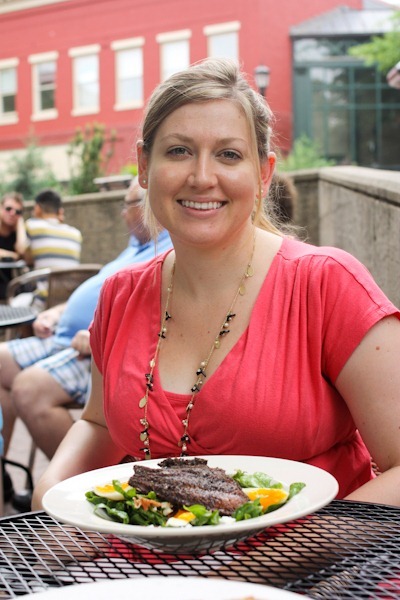 The bread was buttered and grilled – this was one awesome sandwich!!! 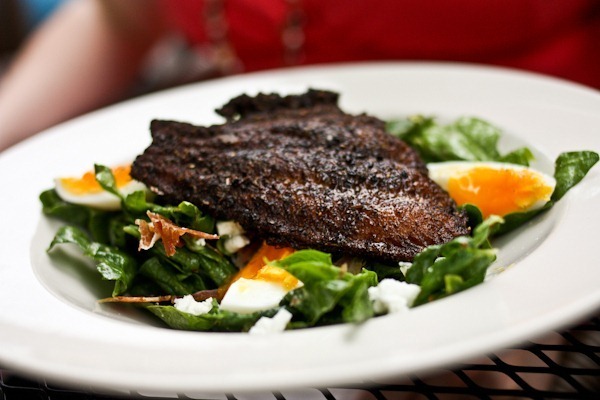 Holly had the spinach salad with egg, cheese, virginia ham and the amazing blacked catfish! 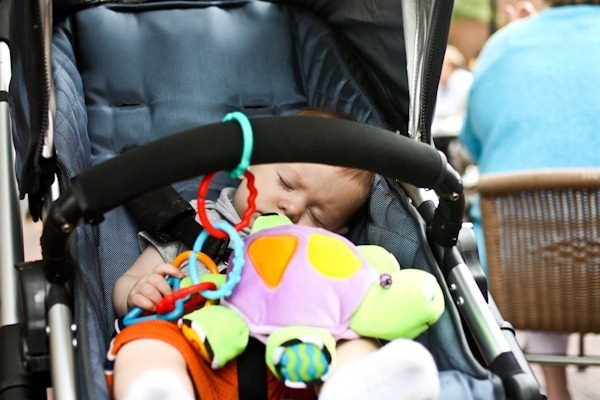 Finn had a dose of breast milk that put him to sleep. Afterwards we stopped into Splendoras for a tiny bambino cone – just the perfect amount of ice cream for a bite! Love the tiny ice cream cone! 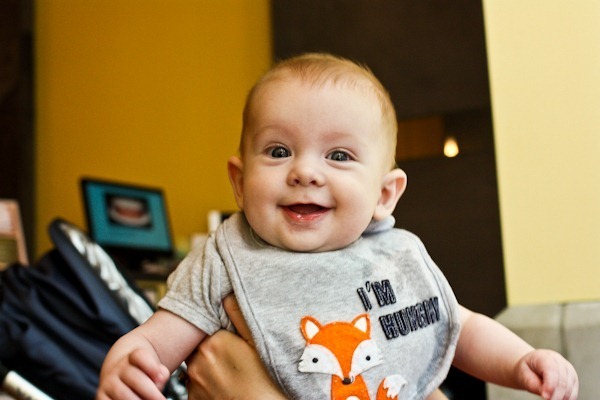 What an adorable bib! Both of your lunches look divine. Happy Hump Day! 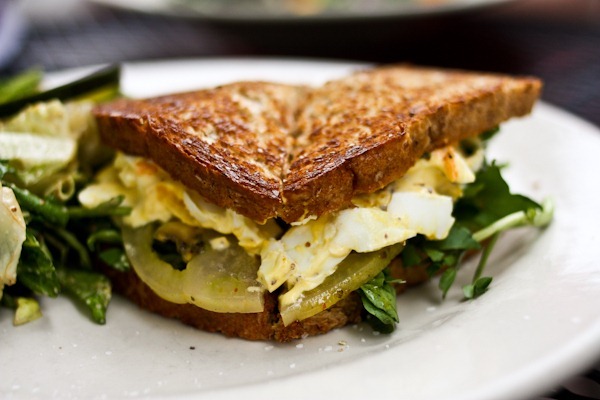 I love a good egg salad sandwich and I don’t have it as often as I would like. Now, I could definitely go for a bambino sized ice cream cone like that! That baby ice cream cone makes my day! I used to LOVE those when I was a kid but can’t find them anywhere near me now! I want one of those sandwiches, stat! 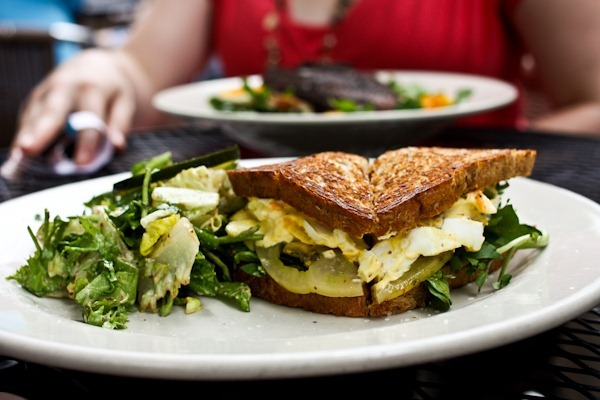 That looks amazingly delicious — love the idea of grilling an egg salad sandwich. That makes the second great sandwich idea I’ve seen this week — the other was one with a homemade artichoke-chickpea spread as the filling. That sandwich does look amazing! Maybe I can try to make one myself one day soon. That is one cute cone. Just the right size. BTW my daughter just informed me that she’s expecting grandchild #2 in November. I’m over the moon. Hope this one’s a girl. omg where did your friend get the bib that her little boy is wearing? So cute! 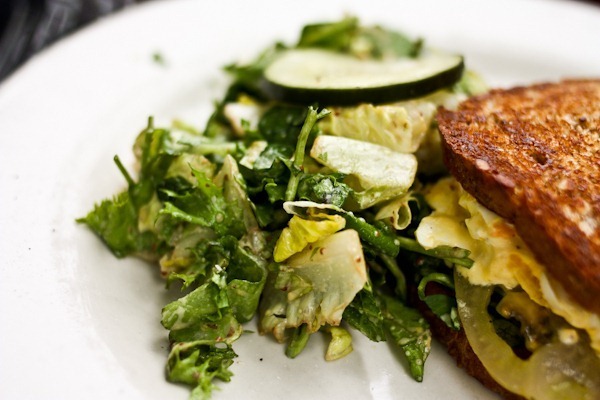 That Southern style egg salad sandwich sounds so good! Green tomatoes haven’t popped up in my grocery yet this year. I love that you say “we”! It is a “we” and you’ll be seeing him soon! And that sandwich looks sooooo good! 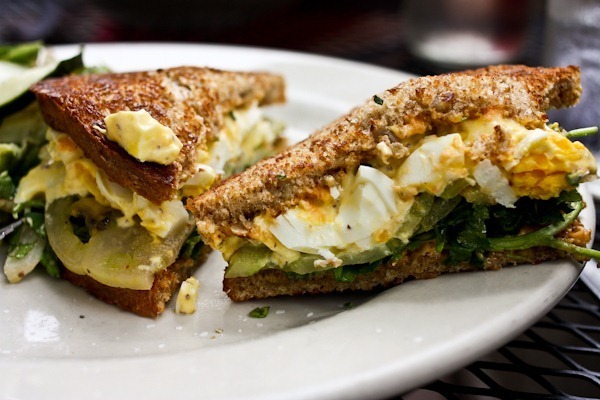 That looks like the best egg salad sandwich I have ever seen! Love the toasted sunflower bread! Looks like some pickles peeking out to satisfy your pickle love! Oh goodness that is an adorable baby! That is the cutest ice cream cone ever! I wish my local shop had that size. A kids size is even gigantic! OMG that’s the cutest little ice cream cone ever!! Perfect size. That bread looks really yummy! a tiny bambino cone – I love it! and what an adorable baby! OMG the baby is so cute!!! Finn is toooo cute 🙂 Could you ask Holly where she got that fox bib? My good friend would go crazy for that as she has a whole fox theme for baby #4! Looks like a fabulous lunch! What a fun way to enjoy the middle of the week! Looks delicious! Oh I love this baby cone! This is exactly what I need when I want ice cream. Cutest baby…and ice cream cone…ever! Finn is SO cute!! I just love his little smile. 🙂 He looks a lot like his Holly. That ice cream cone is perfect! I would love to find a place with something that size. That’s really all you need. cutest baby bib ever! what a cutie! You just wrote “we”?! Welcome to motherhood… it definitely begins before the actual birth. That tiny little ice cream cone is so ridiculously adorable. And delicious-looking! Oh, gee! That is one adorable little boy! I often wish someone would feed ME some warm milk and let me nod off while they ate lunch! Sounds delightful. What a cute little cone. That’s awesome! 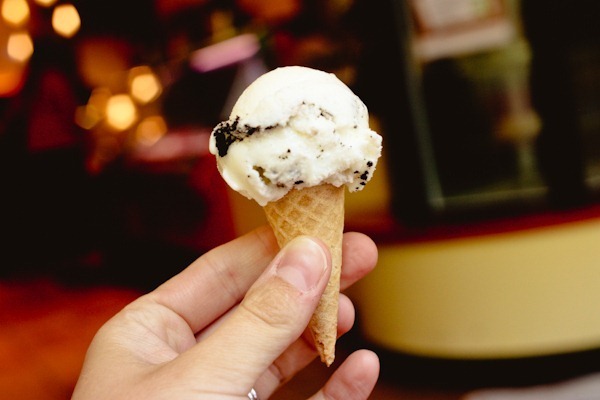 That bambino cone is SO cute..and perfect when you just want a taste rather than a whole scoop! I love that fin was probably the most satisfied customer in town! I’m inspired by your sandwich and have everything on hand to put that together tomorrow for lunch. We are going through a bit of a phase now, after being sick and eating A TON of soup all we want now is sandwiches for lunch and dinner. It’s good for me as they are so quick and easy so I’m enjoying it while it lasts.